Nothing gets the energy up better than listening to an AC/DC album, to rev up your engines. By 1983, AC/DC had a new lead singer, after the successes of Back In Black and For Those About To Rock, We Salute You. Flick Of The Swtich was their next album, and it didn't achieve greatness as the previous two albums. Tensions in the band (drummer Phil Rudd and Malcom Young), which led to Rudd's firing. Drugs and alcohol were a factor as well. Personally, the Bon Scott era did sound different than that of the Brian Johnson era. I also think that Bon Scott was the better lead singer. However, AC/DC with Brian Johnson did produce a rougher edge, and his vocals were the icing on the cake. As I listen to this album, as I write the review, I can easily see how some did claim that this album does sound like previous Brian Johnson songs. The Bon Scott era had more blues and rock; Brian Johnson's songs definitely had/has a raw energy, even with their music today. The standout tracks are definitely the title track, and "This House Is On Fire" (not to be confused with the Kiss song of the same name). The opening track, "Rising Power" also has good credentials, yet as the other tracks blend in, ("Nervous Shakedown," "Landslide," "Guns For Hire"), they're starting to sound the same. Not that there's nothing wrong with this, it's still high energized AC/DC Rock. "Deep In The Hole" slows down the pace so to speak, yet its still as high energized as the other tracks previously heard. "Bedlam In Belgium" almost reminds me of the Brian Johnson rocker, "Shoot To Thrill." "Badlands" equals to the same as "Deep In The Hole," and it also has a slight resemblence to the later years of Led Zeppelin. The album's closing tune, "Brain Shake" returns as high energized. No doubt, this is the typical hard rock we've been grown and loved about Brian Johnson and AC/DC. It is rocking to its full content. Johnson's raspy, growling vocals makes it even better. Although, it would be kinda cool, to hear a slow blues album of Johnson with AC/DC. Bon Scott did this on a few songs when he was alive, yet a full album dedicated to slow blues by AC/DC would be a treat. 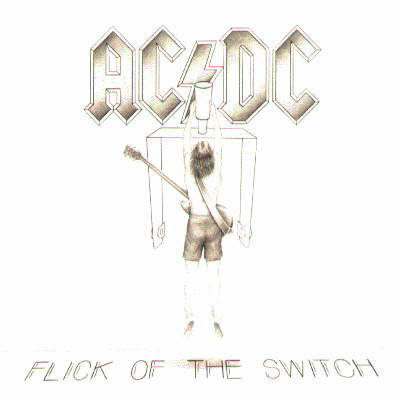 Yes, Flick Of The Switch has its moments; it is a good album, but not as highly rated as others. AC/DC did achieve success again with their albums in later years/decades, and most recently, celebrated another #1 album under their belts with 2008's Black Ice. But for those who want to rock, any AC/DC album will feed the needs. A flick of the switch may have had put a downside for the band for a while, but flicking that switch back up again, not only brought the switch up, it brought up the band's greatness once again. © WSVNRadio.net. All rights reserved. Review or any portion may not be reproduced without written permission. Cover art is the intellectual property of Atlantic Records and is used for reference purposes only.